What: This project focuses on climate change in the High Arctic. Because of the ice-albedo feedback the Arctic is experiencing warming at more than twice the rate of lower latitude sites. To put these changes in a longer-term perspective we are attempting to use the varved sediment record in glacier-fed Lake Linné and we are studying what factors influence annual sedimentation in the Lake. Summer work includes work on the Linné Glacier, the sediment flux and temperature of the inflow stream and the physical and sedimentological conditions in Lake Linné. When: The program will run from 10 July to 10 August and will consist of a field component in Svalbard, Norway and a lab component at Mt. Holyoke College, Massachusetts. Where: We will convene in Massachusetts for a few days of equipment organizing and background lectures and then travel as a group to Longyearbyen, Svalbard. Prior to heading to the field site we will spend a few days in town for safety training and orientation. We will then travel by small boat out to Isfjord Radio, a former weather station at Kapp Linné which we will use as a base of operations. After two weeks of field work we will travel back to Longyearbyen and then back to Massachusetts where we will work with data and samples in the lab. Who: You will join a group of highly motivated students from other colleges and you will work closely with this group sometimes directing the field work and sometimes working as a field assistant. Al Werner (Mt. Holyoke College) and Mike Retelle (Bates College) will lead the field excursion and will direct the lab component of the summer experience. Our goal is to introduce students to the Arctic and to engage them in meaningful geoscience-based climate change research. Each student will take-on an aspect of the research that they (with the help of their colleagues) will pursue in the field and subsequently during the following academic year. This program is tailored to rising seniors who have completed most of their geology curriculum and have a demonstrated interest in the Arctic, Quaternary studies and the issue of climate change. Glacier mass balance/factors influencing glacier ablation. Characterization of the spring melt event using weather station data, stream temperature data and daily automated camera images. Characterization of sedimentation events during the 2012/2013 sedimentation year using CTD data, temperature sensor data, current velocity sensors and daily automated camera images. Interpretation of sediment trap samples using visual and X-ray stratigraphy, particle size data and automated sediment trap data. Sediment cores will be recovered to allow a comparison of lamination stratigraphy throughout the lake and to compare with the long term weather record for Svalbard. Other projects are possible depending on student interest and analytical resources at their home institution. The Arctic is a special place – it will captivate you! But it can also be a difficult and dangerous place. Since we are working in polar bear country, we carry high powered rifles, we work long days in the driving rain and we often carry heavy packs on long strenuous (25km) hikes over steep and rugged terrain. For its high latitude location, Svalbard is relatively warm. The average temperature during July is +6º C (43º F). While most days we will be working in rain suits, there will be days when we could potentially work in tee-shirts and other days when we could use all of our warm layers and rain suits when on land. The northern arm of the Gulf Stream passes the west coast of Svalbard bringing relatively warm water and warm air from the south, to Svalbard. At the same time this often creates sharp gradients in temperature, which lead to high winds and rapidly changing weather. Rainy and cloudy weather are common. Because Svalbard is well above the Arctic Circle, you will experience 24 hours of daylight during the entire field season. You will be working outdoors continuously for 12-16 hours in potentially cold, rainy weather five to seven days each week. You will often be working out of small boats on icy lakes. On some days, you will be hiking 15 km (10 miles) or more over rocky ground every day carrying a 15-25 kg (35-50 lb) backpack. We will be hiking on glaciers, loose rocky talus slopes and ice-cored moraines, and crossing meltwater rivers up to 0.5 m (2 ft) deep. The group will return to indoor dormitory facilities every night with catered food, showers, and shared dorm rooms. You will not likely be able to receive mail while in the field but a telephone may be available (at your own expense). We expect to have some shared internet access. Svalbard is home to Polar Bears (Ursus martimus), a marine mammal weighing over 450 kg (1,000 lbs) and standing over 3m (9 feet) tall. Despite its size and awesome strength the polar bear is swift and agile, moves easily on rough ice and steep slopes, and is an excellent swimmer. They typically hunt seals among the sea ice and icebergs but also wander the land and are known to stalk and kill humans, although this is rare. Polar bears are curious, and often investigate any strange object, smell, or noise. They have an acute sense of smell that will lead any bear to a food source many kilometers away. Its eyesight is thought to equal that of a human. Our first line of protection against polar bears is avoiding them! At all times outdoors, everyone must keep constant watch for bears. If we see a bear, we leave the area immediately. NO ONE travels ANYWHERE alone (not even to wander out-of-sight to pee). We will also carry firearms (flare guns and high powered rifles) as last-resort protection against a charging polar bear. You will receive firearm training in Svalbard and everyone will be required to learn to safely handle and accurately shoot these firearms. Even with all precautions, we cannot guarantee that you will not be injured, dismembered, killed, and eaten by a polar bear. Successful applicants typically have completed their coursework for a geology major and have a demonstrated interest in climate change and arctic geology. What: Students will investigate the morphotectonic footprint of earthquake-generated uplift on the Nicoya Peninsula, Costa Rica. This project will expand upon preliminary geomorphic, geodetic, and seismologic data showing patterns of coseismic rupture and coastal uplift generated by the recent Mw7.6 Nicoya Earthquake of 5 September 2012. Project students will build upon several decades of prior research on subduction generated coastal uplift on the Nicoya Peninsula [e.g., Hare and Gardner, 1985; Marshall and Anderson, 1995; Marshall et al., 2001-2012], including a highly successful 1998 Keck project [Gardner et al., 2001]. The participating students will conduct fieldwork along the Nicoya Peninsula coastline, learning research techniques of tectonic geomorphology, paleoseismology, and GPS geodesy. Where: Nicoya Peninsula, Costa Rica, Central America (passport is required). Who: Nine undergraduate students and three project leaders: Dr. Jeff Marshall (Cal Poly Pomona), Dr. Tom Gardner (Trinity University), and Dr. Marino Protti (Observatorio Volcanológico y Sismológico de Costa Rica, OVSICORI-UNA). Figure 1. Digital elevation model of northern Costa Rica showing relationship of onshore topography (NASA-SRTM) and offshore bathymetry (IFM-GEOMAR). Two segment boundaries on the subducting Cocos Plate intersect the margin offshore of the Nicoya Peninsula: 1) a morphologic break between smooth and rough sea floor domains (thin dashed line); and 2) a fracture zone trace (thick dashed line) that divides crust formed at the East Pacific Rise (EPR) from that formed at the Cocos-Nazca spreading center (CNS-1 and CNS-2). Megathrust earthquakes along subduction zones are among Earth’s most powerful and deadly natural hazards. During the past decade, more than a quarter-million people lost their lives to megathrust earthquakes and tsunami in Sumatra (M9.3, 2004), Chile (M8.8, 2010), and Japan (M9.0, 2011). Such catastrophic events are also notable for sudden geomorphic changes along coastlines caused by coseismic uplift or subsidence [e.g., Plafker, 1972; Atwater, 1987]. Earthquake-induced changes in land level result in either emergence or submergence of the coast, shifting the relative position of the shoreline, and all subsequent tides. Evidence of past events is preserved in the sedimentary record of beaches and coastal wetlands, and by such features as emerged tidal platforms and coral reefs [e.g., Taylor et al., 1987; Nelson et al., 1996; Natawidjaja et al., 2006]. Geomorphic and stratigraphic analysis of these features allows geoscientists to unravel the paleoseismic history of convergent margin coastlines [e.g., Sieh, 2006; Satake and Atwater, 2006], and to investigate how earthquake induced crustal displacements affect the long-term growth and decay of coastal topography [e.g., Bull, 1985; LaJoie, 1986; Marshall and Anderson, 1995; Sato and Matsuura, 2007; Rehak et al., 2008]. An excellent place to study these processes is the Nicoya Peninsula on the Pacific coast of Costa Rica, Central America (Fig. 1) [Marshall, 2008]. The Nicoya Peninsula is unique because it is one of the few landmasses along the Pacific Rim located directly above the seismogenic zone of a subduction megathrust fault. Due to its proximity to the subduction zone, the peninsula is particularly sensitive to vertical movements related to the earthquake cycle [Marshall and Anderson, 1995; Feng et al., 2012]. Costa Rica is part of the Central American convergent plate margin, where the Cocos oceanic plate subducts beneath the Caribbean plate at the Middle America Trench [von Huene et al., 2000]. The two plates converge at a rapid rate (~8 cm/yr) along the Nicoya Peninsula [DeMets et al., 2010], resulting in a high seismic potential, as demonstrated by repeated large magnitude (>M 7.5) earthquakes over the past few centuries, including events in 1853 (M≥7.5), 1900 (M≥7.5), 1950 (Ms=7.7), and 2012 (Mw=7.6). Figure 2a-b. a.) Earthquake epicenter map and seismogenic zone profile for Costa Rica (by Laboratorio de Ingenieria Sismica, Universidad de Costa Rica) showing location of 2012 Mw=7.6 Nicoya earthquake (red circle) with respect to two years of prior seismicity (2010-2012). b.) Map of Nicoya Peninsula earthquakes for September 2012 (by Observatorio Volcanológico y Sismológico de Costa Rica, Universidad Nacional) showing distribution of aftershocks and triggered events (red dots) associated with the 5 September 2012 mainshock (blue star). Note two distinct rupture patches outlined by aftershocks beneath the central and southern portions of the peninsula. On 5 September 2012, a major earthquake (Mw=7.6) ruptured the megathrust plate interface beneath the Nicoya Peninsula [Dixon et al., 2012]. This large event was centered 12 km offshore of the central Nicoya coast, at a depth of 18 km (Fig. 2a). Near the hypocenter, the maximum slip exceeded 2 m, and the rupture spread outward along the plate interface to encompass >3000 km2 of the Nicoya seismogenic zone. More than 1700 aftershocks were recorded within the first 5 days (Fig. 2b), outlining two distinct rupture patches, one centered on the central coast, and the other beneath the southern tip of the peninsula. The 2012 Nicoya earthquake was felt throughout much of Central America and resulted in widespread damage to homes, businesses, schools, and health centers across Costa Rica (>$45 million). Thanks to extensive prior public outreach by geoscientists and government officials, Costa Rican citizens were acutely aware of the seismic hazard posed by the Nicoya seismogenic zone. For this reason, the population was well prepared and emergency personnel reacted swiftly, minimizing earthquake casualties (<200 injured, 0 deaths). Although a major disaster was averted, this powerful earthquake was a stark reminder to local residents that they live in a region of substantial seismic hazard. For geoscientists, the 2012 Nicoya earthquake was a watershed event. The last major earthquake in this area (MS=7.7) occurred in 1950 [Protti et al., 2001], causing widespread damage and casualties, and producing landslides, liquefaction, and pronounced coseismic uplift along the Nicoya coast [Marshall and Anderson, 1995]. Since then, seismologic, geodetic, and geomorphic studies had recognized the Nicoya Peninsula as a mature seismic gap, with a high probability of rupturing in the near future [e.g., Protti et al., 1995 and 2001; Marshall and Anderson, 1995; Marshall et al., 2003-2012; Norabuena et al., 2004; Feng et al., 2012]. In 1989, the USGS gave a 93% probability of a large earthquake occurring here before 2009, listing Nicoya as fourth among the top seismic gaps of the Pacific Rim [Nishenko, 1989]. To monitor precursory seismicity and the build-up of crustal strain, the Observatorio Volcanológico y Sismológico de Costa Rica (OVSICORI-UNA), working with international collaborators, developed a dense network of seismometers and GPS stations across the Nicoya Peninsula (Fig. 3). On September 5, 2012, after 62 years of tectonic strain accumulation, the forecast Nicoya Earthquake finally occurred, generating a wealth of geophysical data [Dixon et al., 2012], and providing an unprecedented opportunity for geologists to capture the near-field pattern of coseismic deformation produced by a major megathrust earthquake. Figure 3. Map of Nicoya Peninsula, Costa Rica showing locations of seismic and geodetic networks, coastal geomorphic study sites, and earthquake epicenters (Dixon et al., 2012). Continuous GPS stations (yellow circles) operated by OVSICORI and University of South Florida. Seismic stations (green triangles) operated by OVSICORI, University of California, Santa Cruz, and Georgia Tech. Geomorphic and paleoseismic field studies conducted at coastal sites (blue dots) by Cal Poly Pomona and Virginia Tech. Preliminary locations for 2012 Nicoya earthquake from USGS (purple star), OVSICORI (orange star), and Lamont-Doherty Global CMT Project (red circle and focal mechanism). In the wake of the 2012 Nicoya earthquake, an NSF Rapid Response Team was organized to collect preliminary geomorphic and geodetic field data to constrain patterns of coseismic deformation across the peninsula [Newman et al., 2012, unpublished]. Geomorphic spot measurements at more than a dozen field sites (Fig. 3) indicate that the earthquake produced up to 0.8 m of coseismic uplift along the central Nicoya coast (Fig. 4) [Marshall and Morrish, 2012, unpublished]. Inversion modeling of preliminary GPS data from the OVSICORI geodetic network yielded consistent results (Fig. 5a), showing maximum uplift adjacent to the earthquake epicenter and decaying outward with distance. Preliminary models based on seismic wave inversion (Fig. 5b) show a bull’s eye of maximum slip (>2m) adjacent to the hypocenter, surrounded by a broader area of decreasing slip across the seismogenic zone beneath the central coast. This rupture pattern is roughly similar to the area of pre-earthquake locking suggested by GPS modeling (Fig. 5a) [Feng et al., 2012]. Earthquake cycle deformation has been observed along convergent margin coastlines worldwide. Famous examples in the geomorphic literature include Chile, Alaska, Japan, Cascadia, Vanuatu, and Indonesia [Plafker, 1972; Matsuda et al., 1978; Bull, 1985; LaJoie, 1986; Atwater, 1987; Taylor et al., 1987; Sieh, 2006]. As the locked interface between two converging tectonic plates snaps free, the upper plate springs forward releasing stored elastic energy in the form of seismic waves (the earthquake). The seaward edge of the plate nearest the subduction trench rebounds upward, resulting in sudden coseismic uplift (and often a tsunami). In contrast, the landward region further from the trench subsides as strain is released. As the plates become locked again and elastic strain begins to build, gradual interseismic movements generally occur in the opposite direction (subsidence in the cosesimic uplift zone and vice versa). Figure 4a-b. Pre & post-earthquake photographs of high tide at Playa Carrillo estuary, showing the magnitude of 5 September 2012 coseismic uplift directly inland of earthquake epicenter: a) July 5, 2012, 3:50 pm (+3.0m high tide), b) Sept 13, 2012, 12:30 pm, (+2.4m high tide). The tide pictured at left was the highest tide for the 2 months preceding the earthquake. Note the coconut debris line left by this tide still visible in the post-earthquake photo at right. While the pre-earthquake high tide at left is 0.6m higher than the post-earthquake high tide at right, the surveyed difference in these tidal levels is ~1.4m, indicating uplift of ~0.8m (Marshall and Morrish, 2012, unpublished data). This cycle of vertical motion in response to elastic strain accumulation and release is an integral part of the way subduction zones work, and is a dramatic manifestation of the forces that generate deadly megathrust earthquakes and tsunami. An interesting question for geomorphologists is how this short-term cycle of elastic motion translates into longer-term permanent deformation that generates topographic relief. How much of the seismic cycle deformation is non-recoverable and permanent? Does coastal topography mirror earthquake cycle deformation patterns? Are earthquake rupture zones long-lived features or are they transient, changing location and shape through time? What other processes contribute to the creation of permanent coastal topography along convergent margins? Figure 5a-b. a) Preliminary rapid GPS solution for continuous stations showing horizontal (black) and vertical (blue) displacement vectors for the 2012 Mw7.6 Nicoya earthquake (solution by JPL, based on data from OVSICORI-UNA and Georgia Tech). Red beach ball shows focal mechanism for mainshock. Contoured colors show modeled distribution of pre-earthquake locking on megathrust fault (Feng et al., 2012). b) Map of the Nicoya Peninsula with preliminary dislocation model (based on seismic wave inversion) showing slip distribution for the 2012 Mw7.6 Nicoya earthquake (by LIS-UCR). Colored contours (key at right) show variable slip decaying from a maximum of >2m near the hypocenter. Area of maximum slip corresponds with area of greatest observed coseismic uplift along the coastline (both geomorphic and GPS data). Along the Nicoya Peninsula’s seaward-facing coastline, net Quaternary uplift is recorded by emergent marine terraces (ancient shorelines) and uplifted alluvial fill (ancient river deposits) [Hare and Gardner, 1985; Marshall and Anderson, 1995; Gardner et al., 2001; Marshall et al, 2001-2012; Sak et al., 2009]. Along the peninsula’s landward-facing gulf coast, net subsidence results in drowned rivers and broad mangrove estuaries. Ongoing geomorphic, paleo-geodetic, and paleoseismic studies [e.g., Marshall et al., 2010; Spotila et al., 2010; Marshall and Spotila, 2011] are revealing upper plate deformation patterns that provide important clues about seismogenic zone segmentation and the periodicity of megathrust earthquakes beneath the Nicoya Peninsula. Field mapping, surveying, and isotopic dating of uplifted paleo-shorelines, river deposits, and wetland sediments allows for calculation of Holocene and Pleistocene uplift rates [e.g., Marshall et al., 2012]. Results indicate that sharp variations in uplift patterns on the Nicoya Peninsula coincide with three distinct domains of subducting seafloor identified through offshore geophysical studies. These seafloor segments (Fig. 1), designated EPR, CNS-1, and CNS-2 [Barckhausen et al., 2001], each originated at distinct oceanic spreading ridges and exhibit contrasts in crustal thickness, surface roughness, and heat flow [e.g., von Huene et al., 2000; Fisher et al., 2003]. Such contrasts may exert important controls on seismogenic zone geometry, seismic coupling, and earthquake rupture behavior [e.g., Newman et al., 2002; Norabuena et al., 2004; DeShon et al., 2006; Schwartz and DeShon, 2007]. This Keck research project will build upon preliminary post-earthquake field studies by filling critical data gaps, addressing key questions about how earthquake-generated uplift impacts coastal geomorphology, and investigating how seismic cycle motions contribute to net deformation and topographic growth. Project students will gain valuable professional experience applying modern field techniques of coastal geomorphology, paleo-seismology, and GPS geodesy. Their efforts and research results will contribute to the growing body of scientific knowledge on convergent margin morphotectonics. Coseismic Coastal Uplift and Impacts on Beach Morphology. Preliminary geomorphic field measurements and GPS data indicate that the 2012 Nicoya earthquake generated up to 0.8 m of coseismic uplift along the central Nicoya coastline. Students working on this project will investigate this coastal uplift through detailed site investigations, collecting additional geomorphic field data, and surveying coastal landforms to further constrain the magnitude and pattern of uplift. Students will use laser range finders, barometric altimeters, hand held GPS, and stadia rods to survey topographic profiles and measure uplift. Students will also investigate the impacts of recent coseismic uplift on the morphology of beaches and rocky shorelines by measuring uplift-related geomorphic changes, including modification of beach profiles, stream incision, shifts in tidal levels, changes in wave erosion, and displacement of tidal ecozones (e.g. mortality of sessile organisms). Coastal Wetland Stratigraphy and Paleoseismic Records. To investigate the history of paleo-earthquakes on the Nicoya Peninsula, students will use hand-gouge augers to extract sediment cores from coastal wetlands. These cores will be examined for evidence of previous coseismic land level changes (e.g. abrupt changes in grain size, soil color, etc.). A pilot sediment coring study [Spotila et al., 2010] revealed compelling evidence of abrupt stratigraphic breaks, consistent with coseismic uplift in several Nicoya wetlands. In this project, we will target additional wetland sites for paleoseismic records in areas of known vertical motion during the 2012 earthquake. The core stratigraphy will be measured, photographed, and described in detail. Organic samples will be collected from cores for radiocarbon dating. In addition, students will document the impact of the recent coseismic uplift on wetland morphology and sedimentation. This will provide important reference data for interpreting stratigraphic evidence of past events. Geomorphology and Petrology of Uplifted Holocene Beachrock Horizons. To study coastal uplift, students will examine Holocene-age carbonate beachrock deposits, a common feature of the Nicoya Peninsula coastline [Marshall et al., 2012]. These tabular horizons of lithified beach sediment extend laterally along the shoreline, creating a natural pavement similar to a concrete sidewalk. Beachrock forms by precipitation of carbonate cement (calcite and aragonite) within intergranular pore spaces of beach sediments in the groundwater excursion zone between high and low tide. These horizons form preferentially where groundwater is abundant near streams and wetlands. As earthquakes elevate the coastline, beachrock horizons are moved upward on the beach face and eventually into the landscape beyond. By surveying their current elevation above sea level and collecting samples for age dating, we will use beachrock horizons as timelines to track the history of net Holocene uplift. Students will survey beachrock outcrops using laser range finders, hand held GPS, and stadia rods. Sites will be photographed and described in detail, and samples will be collected for radiocarbon dating and thin section analysis. Geodetic Evaluation of Co-Seismic and Post-Seismic Deformation. The Costa Rican Volcanologic and Seismologic Observatory (OVSICORI-UNA) operates a dense network of 12 continuous GPS receivers on the Nicoya Peninsula (in collaboration with University of South Florida and Georgia Tech University). In addition, there are more than 15 campaign GPS monuments located throughout the peninsula. Students will work under the direction of Dr. Marino Protti (Senior Research Geophysicist, OVSICORI) to install campaign GPS receivers, service continuous GPS stations, download data, and process/evaluate horizontal and vertical GPS motions to interpret seismotectonic deformation related to the 2012 Nicoya earthquake. Fieldwork will take place in relatively remote locations. While tourism has brought rapid development in some areas, most of the Nicoya Peninsula is still rural and rugged. Field sites will be accessed by four-wheel drive vehicle and by hiking along rocky coastlines and steep trails with dense vegetation. Weather conditions will be hot and humid, with intense tropical sun and occasional heavy thunderstorms. Hats, sunscreen, water, and proper footwear are essential. Insect repellent is recommended. Safety is a critical aspect of this project. Students will work in teams under the supervision of project faculty. Participants are required to be vigilant and aware of potential hazards, including dehydration, heat exhaustion, sunburn, rugged terrain (cliffs, rocky shore platforms, streams/rivers), unfriendly plants (thorny, sharp, or stinging shrubs/trees), and potentially aggressive insects and animals (fire ants, scorpions, mosquitoes, wasps/bees, snakes, livestock). Participants may be exposed to new and significant allergies (mold, mildew, insect bites, poison plants). Those with asthma or other allergy sensitive conditions should take appropriate caution. Emergency medical care is available, but located at substantial distance from field sites. We will stay in small eco-tourist lodges with modest facilities. These hotels provide a relatively safe and comfortable home base and easy access to field areas. We will eat meals prepared by the hotel staff or at local restaurants. Dietary options are limited to what is available on site. While tropical fruits and vegetables are common, most meals consist of rice, beans, meat, poultry, or seafood. We will have limited Internet access, but cell phone coverage and public phones are generally not available. Use of personal electronic devices is prohibited anywhere outside of hotel rooms. To prevent theft, students must be vigilant of personal belongings at all times. Participants should be comfortable living and working in a remote rural setting, within a developing country, immersed in the Spanish language. A valid passport is required for travel to Costa Rica. This project is designed for advanced undergraduate students with an interest in geomorphology and tectonics. Students should be prepared for working in challenging field conditions, in a foreign country. Fieldwork in a tropical setting requires astute observational skills, creative thinking, and an ability to work with limited geologic exposure. Demonstrated experience in field methods is strongly preferred. Students should have taken core courses in geomorphology, mineralogy/petrology, and structural geology/tectonics. Additional coursework in sedimentary geology, stratigraphy, geophysics, optical mineralogy, or GIS is desirable. Acceptance on this project requires academic standing as a rising senior, and completion of a supervised senior thesis (or equivalent) during the following academic year (2013-14), as an integral part of this research effort. The application must include a supporting letter from the student’s home campus thesis advisor. This letter must indicate how the thesis requirement is included in the senior year course load. The advisor should also describe the student’s prior research background and field experience, and how well the applicant will function in the working conditions described above. Atwater, B., 1987, Evidence of great Holocene earthquakes along the outer coast of Washington state: Science, v. 236, 942-944. Barckhausen, U., Ranero, C.R., von Huene, R., Cande, S.C., and Roeser, H.A., 2001, Revised tectonic boundaries in the Cocos Plate off Costa Rica: Implications for the segmentation of the convergent margin and for plate tectonic models: Journal of Geophysical Research, v. 106, p. 19,207-19,220. Bull, W.B., 1985, Correlation of flights of global marine terraces, in Morisawa, M., and Hack, J.T., eds., Tectonic Geomorphology: Proceedings of the 15th Geomorphology Symposia Series, Binghamton, p. 129-152. DeMets, C., Gordon, R.G. and Argus, D.F., 2010, Geologically current plate motions, Geophysical Journal International, v. 181, p. 1-80, doi:10.1111/j.1365-246X.2009.04491.x. DeShon, H.R., Schwartz, S.Y., Newman, A.V., González, V., Protti, M., Dorman, L.M., Dixon, T.H., Sampson, D.E., and Flueh, E.R., 2006, Seismogenic zone structure beneath the Nicoya Peninsula, Costa Rica, from three-dimensional local earthquake P- and S-wave tomography: Geophysical Journal International, v. 164, p. 109-124. Dixon, T., Schwartz, S., Protti, M., González, V., Newman, A., Marshall, J., and Spotila, J., 2012, Research opportunity: Geodetic, geomorphic, and seismic data available for the September 5, 2012 MW7.6 Nicoya Earthquake, Costa Rica: A Direct Hit on a MARGINS Seismogenic Zone Experiment (SEIZE) Focus Site: Eos, Transactions American Geophysical Union. Feng, L., Newman, A.V., Protti, M., González, V., Jiang, Y., and Dixon, T.H., 2012, Active deformation near the Nicoya Peninsula, northwestern Costa Rica, between 1996 and 2010: Interseismic megathrust coupling: Journal of Geophysical Research, v. 117, B06407, doi:10.1029/2012JB009230. Fisher, A.T., Stein, C.A., Harris, R.N., Wang, K., Silver, E.A., Pfender, M., Hutnak, M., Cherkaoui, A., Bodzin, R. and Villinger, H., 2003, Abrupt thermal transition reveals hydrothermal boundary and role of seamounts within the Cocos Plate: Geophysical Research Letters, v. 30, 1550, doi:10.1029/2002GL016766. Gardner, T.W., Marshall, J.S., Merritts, D.J., Protti, M., Bee, B., Burgettte, R., Burton, E., Cooke, J., Kehrwald, N., Fisher, D., and Sak, P., 2001, Holocene forearc block rotation in response to seamount subduction, southeastern Península de Nicoya, Costa Rica: Geology, v. 29, p. 151-154. Hare, P.W., and Gardner, T.W., 1985, Geomorphic indicators of vertical neotectonism along converging plate margins, Nicoya Peninsula, Costa Rica, in Morisawa, M., and Hack, J.T., eds., Tectonic geomorphology: Proceedings of the 15th Geomorphology Symposia Series, Binghamton, p. 76-104. LaJoie, K.R., 1986, Coastal Tectonics, in R.E. Wallace, ed., Active Tectonics, Studies in Geophysics, National Academy Press, Washington, D.C., p. 95-124. Marshall, J.S., 2008, Megathrust earthquakes, coastal uplift, and emergent marine terraces of Costa Rica’s Nicoya Peninsula, in Bierman, P. and Montgomery, D., eds., Key Concepts in Geomorphology, Online Topical Resources, Geomorphology Vignettes [web site]: On the Cutting Edge Program, Science Education Resource Center (SERC), Carleton College, Northfield, Minnesota. Marshall, J.S., and Anderson, R.S., 1995, Quaternary uplift and seismic cycle deformation, Península de Nicoya, Costa Rica: Geological Society of America Bulletin, v. 107, p. 463-473. Marshall, J., and Spotila, J., 2011, Piedras de fuego and the trembling serpent of Nicoya: On the hunt for ancient shorelines and megathrust earthquakes, Nicoya Peninsula, Costa Rica: NSF GeoPRISMS Newsletter, No. 26, Spring 2011, p. 33-36. Marshall, J.S., Gardner, T.W., Fisher, D.M., Sak, P.B. and Protti, M., 2001, Quaternary neotectonics of the Costa Rican coastal fore arc, Field Trip Guide, National Science Foundation MARGINS Program: Central America Tectonics Workshop, Heredia, Costa Rica, July 2001, 62 p.
Marshall, J.S., Gardner, T.W., Protti, M., and Nourse, J.A., 2009, International geosciences field research with undergraduate students: Three models for experiential learning projects investigating active tectonics of the Nicoya Peninsula, Costa Rica, in Whitmeyer, S.J., Mogk, D.W., and Pyle, E.J., eds., Field Geology Education: Historical Perspectives and Modern Approaches, Geological Society of America Special Paper 461, doi: 10.1130/2009.2461(08). Marshall, J.S., Khaw, F., Parra, J.G., Annis, L.K., and Protti, M., 2003, Marine terraces, subduction earthquakes, and Quaternary uplift of the Nicoya Peninsula, Costa Rica, Central America: Geological Society of America, Abstracts with Programs, v. 35, no. 6, p. 515, Abs. 224-22. Marshall, J.S., LaFromboise, E.J., Utick, J.D., Khaw, F., Annis, L.K., Parra, J.G., and Protti, M., 2005, Variations in Quaternary coastal emergence along the Nicoya Peninsula seismic gap, Costa Rica: Geological Society of America, Abstracts with Programs, v. 37, no. 7, p. 560, Abs. 256-12. Marshall, J., Morrish, S., Butcher, A., Ritzinger, B., Wellington, K., LaFromboise, E., Protti, M., Gardner, T., and Spotila, J., 2010, Morphotectonic segmentation along the Nicoya Peninsula seismic gap, Costa Rica: Eos, Transactions of the American Geophysical Union, v. 91, Fall Meeting Supplement, Abs. T11D-2138. Marshall, J., Morrish, S., LaFromboise, E., Butcher, A., Ritzinger, B., Wellington, K., Barnhart, A., Kinder, K., Utick, J., Protti, M., Gardner, T., Fisher, D., Simila, G., Spotila, J., Owen, L., Murari, M., and Cupper, M., 2012, Morphotectonic segmentation along the Nicoya Peninsula seismic gap, Costa Rica, Central America: Seismological Society of America, Annual Meeting Program, p. 370. Marshall, J., Osborn, S., Morrish, S., Barnhart, A., Wenceslao, L., Landeros, M., Butcher, A., Ritzinger, B., Wellington, K., Protti, M., Spotila, J., 2012, Beachrock horizons of the Nicoya Peninsula, Costa Rica: Implications for neotectonics and paleogeodesy: Eos, Transactions American Geophysical Union. Matsuda, T., Ota, Y., Ando, M., and Yonekura, N., 1978, Fault mechanism and recurrence time of major earthquakes in Southern Kanto district, Japan, as deduced from coastal terrace data: Geological Society of America Bulletin, v. 89, p. 1610-1628. Natawidjaja, D., Sieh, K., Chileh, M., Galetzka, J., Suwargadi, B., Cheng, H., Edwards, L., Avouac, J., and Ward, S., 2006, Source parameters of the great Sumatran megathrust earthquakes of 1797 and 1833 inferred from coral microatolls: Journal of Geophysical Research, v. 111, B06403. Nelson, A., Jennings, A., and Kashima, K., 1996, An earthquake history derived from stratigraphic and microfossil evidence of relative sea level change at Coos Bay, southern coastal Oregon: Geological Society of America Bulletin, v. 108, p. 141-154. Newman, A.V., Schwartz, S.Y., Gonzales, V., DeShon, H.R., Protti, J.M., and Dorman, L., 2002. Along strike variability in the seismogenic zone below Nicoya Peninsula, Costa Rica: Geophysical Research Letters, v. 29, doi: 10.1029/2002GL015409. Nishenko, S.P., 1989, Circum-Pacific seismic potential, 1989-1999: U. S. Geological Survey Open-File Report 89-86. Norabuena, E., Dixon, T.H., Schwartz, S., DeShon, H., Newman, A., Protti, A., González, V., Dorman, L., Flueh, E.R., Lundgren, P., Pollitz, F., and Sampson, D., 2004, Geodetic and seismic constraints on some seismogenic zone processes in Costa Rica: Journal of Geophysical Research, v. 109, B11403, doi: 10.1029/2003JB002931. Plafker, G., 1972, The Alaskan earthquake of 1964 and Chilean earthquake of 1960; Implications for arc tectonics and tsunami generation: Journal of Geophysical Research, v. 77, p. 901-925. Protti, M., et al., 1995, The March 25, 1990 (Mw = 7.0, ML = 6.8) earthquake at the entrance of the Nicoya Gulf, Costa Rica: Its prior activity, foreshocks, aftershocks, and triggered seismicity: Journal of Geophysical Research, v. 100 (B10), p. 20,345-20,358. Protti, M., Güendel, F., and Malavassi, E., 2001, Evaluación del potencial sísmico de la Península de Nicoya, Heredia, Costa Rica, Editorial Fundación UNA, 144 p.
Rehak, K., Strecker, M.R., and Echtler, H.P., 2008, Morphotectonic segmentation of an active forearc, 37°-41°S, Chile: Geomorphology, v. 94, p. 98-116. Sak, P.B., Fisher, D.M., Gardner, T.W., Marshall, J.S., and Lafemina, P., 2009, Rough crust subduction, forearc kinematics, and Quaternary uplift rates, Costa Rican segment of the Middle American Trench: Geological Society of America Bulletin, v. 121, no. 7/8, p. 992-1012, doi: 10.1130/B26237.1. Satake, K., and Atwater, B., 2006, Long-term perspectives on giant earthquakes and tsunami at subduction zones: Annual Reviews of Earth and Planetary Science, v. 35, p. 349-374. Sato, T., and Matsuura, M., 2007, Cyclic crustal movement, steady uplift of marine terraces, and evolution of the island arc-trench system in southwest Japan: Geophysical Journal International, v. 111, p. 617-629. Schwartz, S.Y., and DeShon, H.R., 2007, Distinct updip limits to geodetic locking and microseismicity at the northern Costa Rica seismogenic zone: Evidence for two mechanical transitions, in Dixon, T., and Moore, J.C., eds., The Seismogenic Zone of Subduction Thrust Faults, Columbia University Press, New York, p. 576-599. Sieh, K., 2006, Sumatran Megathrust Earthquakes – From Science to Saving Lives: Philosophical Transactions of the Royal Society, v. 364 (1845), p. 1947-1963. Spotila, J.A., Kennedy, L.M., Durden, A., Depew, K., Smithka, I., Cunningham, C., Marshall, J.S., Prince, P.S., and Tranel, L.M., 2010, Paleoseismic investigations of the Middle America Trench on the Nicoya Peninsula, Costa Rica: A feasibility study of the Tamarindo estuary: Geological Society of America, Abstracts with Programs, v. 42, no. 5, Abs. 250-3, p. 594. Taylor, F.W., Frohlich, C., Lecolle, J., Strecker, M., 1987, Analysis of partially emerged corals and reef terraces in the central Vanuatu arc-comparison of contemporary coseismic and nonseismic with Quaternary vertical movements: Journal of Geophysical Research-Solid Earth, v. 92 (B6), 4905-4933.
von Huene, R., Ranero, C., Weinrebe, W., and Hinz, K., 2000, Quaternary convergent margin tectonics of Costa Rica: Segmentation of the Cocos Plate and Central American volcanism: Tectonics, v.19, p. 314-334. What: This is a comparative study of inflated and disrupted pāhoehoe lava on Mars and the Earth. The project will involve fieldwork in the Zuni-Bandera Volcanic Field of New Mexico and mapping of potentially analogous lava flows within the Elysium region of Mars. Department of Earth & Environment, Franklin & Marshall College, Lancaster, PA (main location). Zuni-Bandera Volcanic Field, New Mexcio (~10 day trip to Zuni-Bandera Volcanic Field, NM to complete the fieldwork component of the project). Who: 6 students and Professor Andy de Wet (Franklin & Marshall College), Dr Chris Hamilton (NASA-Goddard Space Flight Center) and Dr Jake Bleacher (NASA-Goddard Space Flight Center). The goal of this project is to characterize disrupted pāhoehoe textures within basaltic sheet flows. To do so we will conduct 10 days of fieldwork in the Zuni-Bandera Volcanic Field (ZBVF), NM, where project faculty Chris Hamilton (NASA-GSFC) and Jake Bleacher (NASA-GSFC) have several years of field experience. Our previous work has involved a larger field team and focused largely on mapping the extent to which sheet inflation has occurred with the McCartys flow (in the ZBVF). That work produced numerous new questions about the details related to emplacing each sheet lobe, or plateau. We have previously stated that the locations of slabby pāhoehoe patches within a plateau appear to be random. Mapping the location and size of these patches as part of this study will enable us to assess if the spatial distribution is random or if it displays organized relationships with other features such as inflation pits or plateau margins, or if the slabby terrain might outline pathways along which the flow was concentrated in later stages of flow emplacement. (Hon et al., 1994) where t is time in hours and C the crust thickness in meters. By measuring the thicknesses of slabs we can determine if a given patch has experienced more than one disruption event, and whether different areas of the sheet appear to have experienced one or more disruption events at similar times after the initiation of crust formation. Jake Bleacher has worked with Tim Orr (USGS, Hawaiian Volcanoes Observatory) to characterize one feature in the Bandera flow as a shatter ring. However, Orr has identified 14 additional features across the Bandera flow that are suspected to be shatter rings. Confirmation of several additional shatter rings would support the hypothesis that these features together outline a flow pathway, or tube, within the Bandera flow that was used to deliver lava to the flow front. Completion of all three field tasks will provide the students with a strong background in identification of disrupted pāhoehoe textures on Mars. Potential papers that might result from this work include 1) Mapping the location of the Bandera lava tube by identification of a chain of shatter rings, and 2) Characterization of inflation pulses within one sheet lobe of the McCartys flow, NM. In addition to fieldwork in New Mexico, we will conduct lava flow facies mapping of lava flows within the Elysium region of Mars. There are many examples of features within a small portion of this flow field that are analogous to the Bandera and McCartys inflated and disrupted flows. This style of facies mapping is only now becoming possible due to the acquisition of images with the Mars Reconnaissance Orbiter (MRO) Context Camera (CTX) at 6-12 m/pixel, and the High Resolution Imaging Science Experiment (HiRISE) at resolutions below 1 m/pixel. These images enable for the first time detailed mapping at a scale at which the textures and features that are indicative of lava inflation, and lava disruption can be discerned. Chris Hamilton has extensive experience mapping this flow field (Hamilton et al., 2010, 2011), and has spent several years requesting targets within this area for the HiRISE team, many of which are now acquired and released to the public. In addition to mapping surface textures across the flow several specific features could be examined in detail as part of a student project. One example of possible features to be examined by students is enigmatic ringed pits. These features have been suggested to represent unique types of impact craters or features related to ice/volatile processes, although no detailed study has yet been conducted. However, they display many similarities with inflation pits as seen in the McCartys flow, or could also share a common formation process with terrestrial shatter rings. Similarly, students can examine the margins of the flow field for additional evidence of inflation clefts. Broader goals include exposure to planetary geology, a greater appreciation of the role of NASA in planetary exploration and research, develop experience in doing original research, work together in a team of researchers with a common goal, exposure to research with a broad appeal and relevance. One of the challenges of doing research on Mars is that everything is based on remote sensing, theoretical considerations, and analog studies. We are planning to take a 10-day trip to the Zuni-Bandera Volcanic Filed in New Mexico to directly observe and measure processes and features that are probably direct analogs to features the students will be mapping on Mars. Chris Hamilton and Jake Bleacher have extensive experience mapping at this location and know the area very well. We have clear goals for the fieldwork but we will also respond to the interests of the students in crafting specific projects. We may visit the Air and Space Museum in Washington, which has an excellent planetary exhibition. In addition to the Keck Symposium, we will explore the possibility of presenting the results of this research at LPSC in Houston or NE-GSA in Lancaster, PA in 2014. The morphologies of lava flows generated by effusive basaltic eruptions can provide a record of paleo-eruption conditions at the time of emplacement. Basalt, when in liquid form, is a Bingham fluid (opposed to a Newtonian fluid like water). However, as the flow cools its rheology will change, first to a viscoelastic material and then to a brittle solid. Generally, the cooling-induced increase in viscosity of a basalt flow during emplacement will increase the confining strength of its margins and tend to resist flow. However, depending on the eruption rate from the vent and local discharge rate through a lava pathway, lava flow velocities may be great enough to disrupt the surface crust. The balance between confining strength and internal stresses can produce a variety of flow surface textures over multiple scales. Basalts are commonly divided into pāhoehoe (smooth) and ʻaʻā (rough) textures. ʻAʻā tends to form when the viscosity and/or velocities of the flow are high because the associated shear stresses will tear the surface of the flow into breccia. The velocity profile across the surface of the flow will typically transport the breccia to the flow front and margins, thereby producing a channelized flow with a rough and spinose surface texture. In contrast, pāhoehoe textures form when a flow viscosity and/or local discharge rates are low enough that continuous deformation of the confining viscoelastic layer will prevent complete disintegration of the surface crust, thereby allowing lava to be transported through thermally insulated internal pathways located beneath a smooth crust, or in other words, the cracks and tears in the crust can be healed and a smooth surface is produced. Earth Science studies of basaltic eruptions tend to focus on hazard assessment modeling, with the goal of predicting regions of lava inundation given a range of likely eruption parameters. In contrast, studies of martian lava flows are typically concerned with estimating eruptions parameters based on the characteristics of previously emplaced flows. In other words, terrestrial lava flow studies generally involve forward modeling, whereas martian studies are typically aimed at using similar models to “back out” the eruption conditions. The simple distinction between pāhoehoe and ʻaʻā end-members has generally been adequate for mapping flow fields with the goal of establishing basic models of flow emplacement, but there exist a range of intermediate flow types that defy such basic categorizations. Determining the characteristics and emplacement conditions associated with these transitional flow types therefore represents the next big step in terms of understanding the diversity of lava flow morphologies and modeling their emplacement processes and paleo-environmental significance on Earth and Mars. Disrupted pāhoehoe is a term used to describe a rough basaltic texture (at the meter scale) that does not form in the same continuous manner as an ʻaʻā flow. This process occurs during catastrophic events that disrupt already cooled pāhoehoe crust through drastic changes in the eruption conditions at the vent or local discharge rates through the sudden release of lava stored within a segment of the lava pathway system (e.g., rupture of the confining margins of a perched lava pond). However, given that both ʻaʻā and disrupted pāhoehoe can be rough in a general sense it can be difficult to distinguish them in remote sensing imagery, which could lead to misinterpretations of lava flow type in remote locations on the Earth and on planetary surfaces such as Mars. In this study, we will focus on characterization of disrupted pāhoehoe textures on flows in the Zuni-Bandera Volcanic Field (ZBVF), NM, to establish a context for interpreting the significance of analogous sheet-like flow units in the Elysium region of Mars. The ZBVF is composed of >100 monogenetic vents (low shields and cinder cones) from which their basaltic lava flows coalesce (Luedke and Smith, 1978; Luedke, 1993) to produce a “plains-style” (Greeley, 1982) volcanic province. Within the ZBVF a large number of basaltic volcanic features are well preserved (Nichols (1946). We plan to conduct field work on the Bandera and McCartys flows. The Bandera and McCartys flows are the two youngest flow fields in the ZBVF at 9.5-10.9 kyrs and 2.5-3.9 kyrs respectively. The McCartys flow is characterized as a pāhoehoe sheet flow with sections of ʻaʻā. At the scale of 10s to 100s of meters, the flow comprises multiple topographic plateaus and depressions. Some depressions display level, smooth floors, while some are bowl shaped with floors covered in broken lava slabs. The boundaries between plateaus and depressions are also typically smooth surfaces that have been tilted to angles sometimes approaching vertical. The upper margin of these tilted surfaces displays large cracks, sometimes containing squeeze-ups. The bottom boundary with smooth floored depressions typically shows embayment by younger lavas. It appears that this style of terrain represents the emplacement of an extensive sheet that experiences inflation episodes within preferred regions where lateral spreading of the sheet is inhibited. Inflation involves hydraulic lifting of large sections of surface crust to accommodate increased volume of the liquid core. Depressions are often the result of non-inflation and can be clearly identified by lateral squeeze-outs along the pit walls that form when the rising crust exposes the still liquid core of the sheet. These areas form broad, elevated plateaus of generally smooth pāhoehoe lava. Within the sheet flow units we have identified locations of “slabby” pāhoehoe, which forms when the crust of an inflating sheet flow fractures during inflation, but does not become part of a laterally emplaced rubble unit. As such, slabby lavas typically form slabs for which the thickness relates to the amount of time that the crust had cooled prior to disruption. Because the region is covered by trees and shrubs, we have been unable to map the extent and distribution of slabby lava across an inflated plateau, nor have we systematically determined if these slabby sections comprise similar slab thicknesses, or a multi-modal distribution of thicknesses, which might suggest that the flow experienced multiple catastrophic pulses of increased eruption rate or local discharge rate. The Bandera flow is characterized as an ʻaʻā and tube-fed pāhoehoe flow. The Bandera Tube is easily accessible within the El Malpais National Monument. However, in the distal sections of the flow field the traces of the tube (open roof sections and accessible drained tube areas) are lost within an extensive pāhoehoe sheet. However, this sheet displays numerous quasi-circular, rough patches that appear to be somewhat aligned in a pattern similar to open roof tube sections closer to the vent. These features are thought to represent shatter rings (Orr, 2010) as are seen in Hawaiʻi (Per. Com. Tim Orr, 2010), but have not been confirmed. Shatter rings form over lava tubes as changes in flux though the tube result in over pressurization and upheaval of the crust above the tube. As such, this feature is a form of disrupted pāhoehoe. Volcanic plains on Mars are composed of lava flows and their morphologies provide information about changing eruption conditions on the planet through time. Elysium Mons and surrounding Elysium Planitia form the second largest volcanic province on Mars, after Tharsis. The ages of surficial volcanic plains units in this region span from the Hesperian to Amazonian (Tanaka et al., 2005) and include some of the youngest flows on the planet. In this study will focus on pahoehoe-like lava flow units identified in northeastern Elysium Planitia by Keszthelyi et al. (2010) and Hamilton et al. (2010, 2011). The region of interest covers ~30,000 km2 and includes a diverse range of lava flow morphologies related to lava flow inflation and surface disruption. Although few people have studied this flow unit in particular, the surrounding region includes several major outflow channels that are widely interpreted to have been carved by water during catastrophic aqueous outflow events (e.g., Plescia, 1990, 1993, 2003; Fuller and Head, 2002; Burr et al., 2002; Burr 2005; Burr and Parker, 2006). However, more recent studies have demonstrated that the surfaces of these outflow channels appear to be covered in lava (e.g., Jaeger et al., 2007, 2008, 2010; Hamilton et al. 2010c, 2011; Ryan and Christensen, 2012), which suggests that volcanic processes have played a role on the modification of these channels as well. Careful examination of flow units in northeastern Elysium Planitia is therefore important for distinguishing between volcanic and aqueous flow origins. These hypotheses can be distinguished from one another by identifying landforms indicative of inflation and surface disruption, which are typical of lava flows, but not of aqueous flow deposits. Inflation refers to the process by which lava flows thicken through endogenous growth. This process is analogous to the inflation of a balloon in which incoming fluid is retained by a deformable layer that expands to accommodate the new volume. However, if the internal pressurize of the balloon exceeds its confining strength, then the balloon may rupture. In an analogous fashion, newly emplaced lava will cool and develop rheologic gradient along its margins that includes a brittle outer core, underlying viscoelastic layer, and fluidal (Bingham) core. The outermost layers may crack and continuously deform to produce inflation structures such as tumuli, lava-rise plateaus, inflation clefts, and lava-rise pits (Walker, 1991), but if the internal pressure suddenly increases due to sudden changes in local discharge rate, then the surface of lava may be disrupted into slabs and auto-brecciated rubble (Guilbaud et al., 2005). As such, disrupted pāhoehoe can be indicative of non-uniform emplacement rates, particularly at the local scale within a flow. Developing field experience to confidently identify these surface features in remote sensing data is therefore vital to determining the origin of flow units in Elysium Planitia and other volcanic regions of Mars. The student projects will comprise three components: Component 1 will be the field work in the Zuni-Bandera Volcanic Field in New Mexico; Component 2, will be the mapping of volcanic features in the Elysium area of Mars; Component 3 will be the continuing research during the following academic year (access to ArcGIS required). The students will work in pairs to map various volcanic features in the Zuni-Bandera Volcanic Field. They will likely use a variety of techniques including detailed mapping using GPS (available from F&M and NASA). Depending on the particular interests of the students, samples may be collected and could be analyzed using the lab facilities at F&M (XRF, XRD, ICP etc). Component 2, Mapping volcanic features in the Elysium area of Mars. Download, georeference and assemble the required datasets. We will be using a wide variety of datasets including MOLA (gridded data product), THEMIS, CTX and HiRISE data. We will use ArcGIS to build the required databases and compete the mapping and analysis. Recognize and develop criteria, and map the various morphological features associated with lava flows on Elysium. Measure various parameters such as aerial extent, surface texture, cross-sections etc. Compare these features to analog features on the earth (including observations made during the field work in New Mexico). Interpret the origin of these features. Place the formation of these features into the broader context of the geological evolution of Mars by mapping their boundaries to determine their relationship with other volcanic deposits. Complete the database begun over the summer. Continue the mapping of the volcanic features of Elysium, compare these observations to the features mapped in the Zuni-Bandera Volcanic Field (need access to the ArcGIS software). Complete a similar study in other areas of Mars and make comparisons to other terrestrial locations (for example Hawai’i). Come to conclusions about the competing interpretations of the origin of various landforms on Elysium, specifically whether they are lava flows or aqueous flow deposits or some combination of the two. Draw broader conclusions about the role of volcanic and fluvial processes in the evolution of Mars. The project will start in New Mexico with 10 days of field work, we will then travel to Franklin & Marshall College, Lancaster Pa for the remainder of the project. New Mexico: During the field work we will be based in Grants New Mexico and travel daily to the field sites. Accommodation will be in a motel (no camping). Expect the field work to be very physically demanding involving long days in rough terrain under hot, dry conditions (average July high temperature is 91oF). Students will be expected to bring there own field clothing and equipment including a backpack, sturdy boots (not sneakers! ), water bottle, long pants, hat, and leather-palmed gloves. A camera and hand-held GPS would be helpful but specialized equipment such as high precision GPS units will be supplied by the project. F&M: While in Lancaster the students will stay in college housing but will prepare their own food; computer and analytical lab work will be carried out in the Department of Earth & Environment. Burr DM, Grier JA, McEwen AS, and Keszthelyi LP (2002) Repeated aqueous flooding from the Cerberus Fossae: Evidence for very recently extant, deep groundwater on Mars. Icarus, 159, 53-73. Burr DM (2005) Clustered streamlined forms in Athabasca Valles, Mars: Evidence for sediment deposition during floodwater ponding. Geomorphol., 69, 242-252. Burr DM, Parker A (2006) Grjotá Valles and implications for flood sediment deposition on Mars. Geophys. Res. Lett., 33LL22201, doi:10.1029/2006GL028011. Greeley, R (1982) The Snake River Plain, Idaho: Representative of a new category of volcanism, J. Geophys. Res., 87(B4), 2705- 2712. Guilbaud MN, Self S, Thordarson T, Blake S (2005) Morphology, surface structures, and emplacement of lavas produced by Laki, A.D. 1783-1784. Geol. Soc. Amer. Spec. Pap., 396(0), 81-102. Hamilton CW, Fagents SA, and Wilson L (2010) Explosive lava-water interactions in Elysium Planitia, Mars: Constraints on the formation of the Tartarus Colles cone groups. J. Geophys. Res., 115, E09006, doi:10.1029/2009JE003546. Hamilton CW, Fagents SA, and Thordarson T (2011) Lava-ground ice inteactions in Elysium Planitia, Mars: Geomorphological and geospatial analysis of the Tartarus Colles cone groups. J. Geophys. Res., 116, E03004, doi:10.1029/2010JE003657. Hon, K, Kauahikaua, J, Denlinger, R, Mackay K, (1994) Emplacement and inflation of pahoehoe sheet flows: Observations and measurements of active lava flows on Kilauea Volcano, Hawaii. Geological Society of America, Bulletin. 106: 351-370. Jaeger WL, Keszthelyi LP, McEwen AS, Dundas CM, Russell PS (2007) Athabasca Valles, Mars: a lava-draped channel system. Science, 317, 1709-1711, doi:10.1126/science.1143315. Jaeger WL, Keszthelyi LP, McEwen AS, Dundas CM, Russell PS (2008a) Response to comment on “Athabasca Valles, Mars: a lava-draped channel system”. Science, 320, 1588c, doi:10.1126/science.1155124. Jaeger WL, Keszthelyi LP, Skinner Jr. JA, Milazzo MP, McEwen AS, Titus TN, RosiekMR, Galuszka DM, Howington-Kraus E, Kirk RL, the HiRISE Team (2010) Emplacement of the youngest flood lava on Mars: a short, turbulent story. Icarus, 205(1), 230-243, doi:10.1016j.icarus.2009.09.011. Keszthelyi L, Jaeger W, Dundas C, Martínez-Alonso S, McEwen AS, Milazzo MP (2010) Hydrovolcanic features on Mars: Preliminary observations from the first Mars year of HiRISE imaging. Icarus 205, 211-229, doi:10.1016/j.icarus.2009.08.020. Luedke, RG (1993) Maps showing distribution, composition, and age of early and middle Cenozoic volcanic centers in Arizona, New Mexico, and West Texas, US Geological Survey, Misc. Inv. Series Map, 1:1,000,000 scale, Map I-2291-A. Luedke, RG, Smith, RL (1978) Map showing distribution, composition, and age of late Cenozoic volcanic centers in Arizona and New Mexico: US Geological Survey, Misc. Inv. Series Map I-1091A. Nichols, R L, (1946) McCartys basalt flow, Valencia County, New Mexico: Geological Society of America Bulletin, v. 57, p. 1049-1086. Orr, TR (2010) Lava tube shatter rings and their correlation with lava flux increases at Kilauea Volcano, Hawaii, Bulletin of Volcanology, doi:10.1007/s00445-010-0414-3. Plescia JB (1981) The Tempe Volcanic Province, of Mars and comparisons with the Snake River Plains of Idaho. Icarus, 45, 586-601. Plescia JB (1990) Recent flood lavas in the Elysium region of Mars. Icarus, 88, 465-490. Plescia JB (1993) An assessment of volatile release from recent volcanism in Elysium, Mars. Icarus, 104, 20-32. Plescia JB (2003) Cerberus Fossae, Elysium, Mars: A source for lava and water. Icarus, 164, 79-95. Ryan AJ, Christensen PR (2012) Coils and polygonal crust in the Athabasca Valles Region, Mars, as evidence for a volcanic history. Science, 27, 449-452, doi:10.1126/science.1219437. Tanaka KL, Skinner JA, Hare TM (2005) Geologic map of the northern plains of Mars. U.S. Geological Survey, Science Investigation Map Series, Map 2888. Walker GPL (1991) Structure, and origin by injection of lava under surface crust, of tumuli, `lava rises´, `lava-rise pits´, and `lava-inflation clefts´ in Hawaii. Bull. Volcanol., 53, 546-558. Where: Wesleyan University. The project consists mainly of spatial analyses using ArcGIS but will also include training in field data collection. 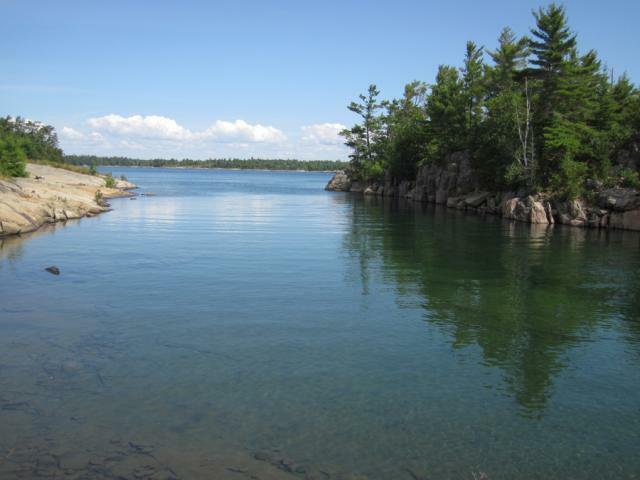 The Great Lakes have been experiencing a low-water period over the past decade but existing data on island area in The Massasauga is based on high-water stages of the lake. This project will combine aerial photo and satellite imagery interpretation with field data to examine the influence of water level changes on shoreline modifications (island area, shape, composition) and island ecosystems. This project will test two hypotheses: (1) Larger island sizes and increased connectivity during low water stages of the Georgian Bay are correlated with an increase in plant species richness and (2) Islands with a greater percentage of growth during low water stages will have a greater increase in non-native plant species. Little is known regarding the role of feedbacks between coastal processes, coastline geomorphology, and shoreline vegetation on species richness patterns on islands. Shorelines in The Massasauga are varied (e.g. steep cliff, sandy beach, cobble shore) and therefore affect the colonization and persistence ability of plants differently. The results of this project will shed light on the applicability of the prevailing model of island biogeography in areas of changing shoreline configuration and may contribute to a contemporary theory of island biogeography. This has real-world relevance, such as the misapplication of the equilibrium model in the design of nature reserves. The Canadian Shield bedrock of The Massasauga consists of the Parry Sound Greenstone Belt (metavolcanic, metasedimentary, and igneous) and the Ontario Gneiss Belt, both of Precambrian origin (Cordiner 1977; Sly & Munawar 1988). As part of the Grenville Peneplain, the general profiles of the islands are relatively flat, ranging from a few meters below lake level in depression basins to circa 50 m above lake level. The bedrock-dominated topography with thin, discontinuous sediments of glacial till and alluvium is due to bedrock erosion and substrate removal during periods of glacial abrasion and post-glacial lake wave-washing (van Luit, 1987; Larson & Schaetzl, 2001). The Thirty Thousand Island archipelago was formed by glacial scouring of the Canadian Shield, erosion from glacial meltwater drainages, and post-glacial isolation (Hirvonen & Woods, 1978). During and following deglaciation, The Massasauga islands periodically emerged and submerged with high and low lake stands. The Massasauga islands permanently emerged as dry land 3-4 ka, following isostatic rebound and draining of the higher than present day lake levels associated with the postglacial Nipissing Great Lakes Periods (Hirvonen & Woods, 1978). Lake levels for the past 2.5 ka show a stabilized mean of 177 m asl (Eschman & Karrow, 1985). Historic lake levels in the Great Lakes basin show marked fluctuations between approximately 175 and 178 m asl, with chart datum at 176 m asl. In 1986, the record high level was approached with annual mean water levels at 177.5 m asl (Bishop 1990). Since 1998, water levels have fallen below the long-term historic average of 177 m asl. Current lake levels (2011annual mean 176.04 m asl; August 2012 monthly mean 175.97 m asl) are below the historic average, approaching the lowest recorded annual mean water level of 175.68 m asl from 1964. (Seasonal high levels for the Georgian Bay are typically in July and seasonal low levels are during mid to late winter.) Low elevation islands (< 5 m maximum elevation) and all island shorelines emerge and submerge with these fluctuations. Calculate differences in island area between different field collection years. Examine lake level changes and associated land cover changes on islands previously inventoried for plant species richness using orthoimagery in ArcGIS. The fieldwork occurred during low-water intervals but the base data for the official maps and GIS were configured by the Ontario Ministry of Natural Resources during a high-water period. The student will use orthophotos (georeferenced aerial photographs) from the years of data collection (2001, 2006, and 2011) to digitize new island polygons, calculate island areas, and calculate differences in island areas among the three years. This project involves the application of ArcGIS geoprocessing tools. Calculate changes in island shape and connectivity. Determine differences in island shape and isolation/connectivity among the fieldwork years in order to discern if changing shapes or isolation relate to differences in temporal variations in plant species richness. This project involves the application of spatial analysis tools in ArcGIS. Predict island area, shape, and connectivity changes with continued declining lake levels. Although lake levels fluctuate on daily, seasonal, annual, and long-term cycles, recent studies have indicated that Great Lakes water levels will decline 1 m by 2050 (Mortsch et al. 2000). The projection is based on climate change predictions of increased temperatures in the region, increased lake surface evaporation, and extreme seasonal precipitation patterns. Implications of declining water levels on island and shoreline habitats are few (see Schwartz et al. 2007). One student can use bathymetric and elevation data with water level scenario predictions to produce shoreline models. Although the model will be useful for economic, recreation, navigation, etc purposes, the data will be used to predict habitat modifications for biodiversity conservation of the archipelago. Students will be housed in Wesleyan University dormitory-style housing. Kitchen facilities are available and a food stipend is provided. Working conditions involve spending time in a computer lab using GIS software to analyze large data sets. Students should be well-organized and detail-oriented. Two days of field work are planned which involve riding up to 2 hours (one-way) in vans, working outdoors regardless of weather, navigating on foot through vegetation without the aid of trails, and collecting data in semi-rugged conditions. During the field component, there is the possibility of interaction with toxic plants or dangerous insects or animals. Students should bring an external hard drive (250 GB minimum recommended), notebook, sturdy hiking shoes, water bottle, and a small backpack. If a student wishes to use a personal laptop for the project, a one-year license of ArcGIS 10.1 will be provided. No prerequisites. However, priority will be given to students who have had GIS and/or remote sensing coursework. Courses in geomorphology and introductory statistics will also be helpful. Bishop, C.T. 1990. Historical variation of water levels in Lakes Erie and Michigan-Huron. Journal of Great Lakes Research 16:406-425. Eschman, D.F. & Karrow, P.F. 1985. Huron basin glacial lakes: a review. In Quaternary Evolution of the Great Lakes (ed. by P. Karrow and P. Calkin). Geological Association of Canada Special Paper 30. Hirvonen, R. & Woods, R.A. 1978. Georgian Bay Islands National Park Integrated Resource Survey. Forest Management Institute, Ottawa. Larson, G. & Schaetzl, R. 2001. Origin and evolution of the Great Lakes. Journal of Great Lakes Research 27:518-546. Mortsch, L.D., H. Hengeveld, M. Lister, B. Lofgren, F. Quinn, M. Slivitzky and L. Wenger. 2000. Climate change impacts on the hydrology of the Great Lakes-St. Lawrence system. Canadian Water Resources Journal 25:153-179. Schwartz, R.C., P.J. Deadman, D.J. Scott and L.D. Mortsch. 2007. Modeling the impacts of water level changes on a Great Lakes community. Journal of the American Water Resources Association 40:647-662. Sly, P.G. and M. Munawar. 1988. Great Lake Manitoulin: Georgian Bay and the North Channel. Hydrobiologia 163:1-19.